Who was William Cullen Bryant? 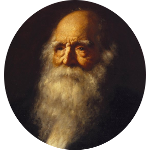 William Cullen Bryant was an American poet and journalist. Although today he is mostly remembered for his poetry, including his most famous poem Thanatopsis, he spent half a century as the Editor-in-Chief and part owner of the New York Evening Post. William Cullen Bryant is a descendant of Mayflower passengers John Alden and Francis Cooke. Bryant's mother is a descendant of John Alden, while both of his parents descend separately from Francis Cooke. It also seems only fitting that he have a number of literary cousins including fellow poets Henry David Thoreau and Henry Wadsworth Longfellow. Presidential family connections include Ulysses S. Grant, William Howard Taft, Calvin Coolidge, Franklin D. Roosevelt, both Presidents Adams, and both Presidents Bush. He also has a connection to the current royal family through a kinship with Princess Diana.